For the fifth smoothie in the series, I thought it would be appropriate to make a drink perfect for those of us celebrating Independence Day tomorrow. Even if you aren’t celebrating, I highly recommend trying this smoothie; it has the perfect balance of tartness and sweetness, it’s super cold and refreshing, plus all three layers are just as delicious mixed together. 1. Blend the ingredients for each layer (separately of course). You may want to put each layer into the freezer to prevent from melting while you’re making the smoothie. 2. 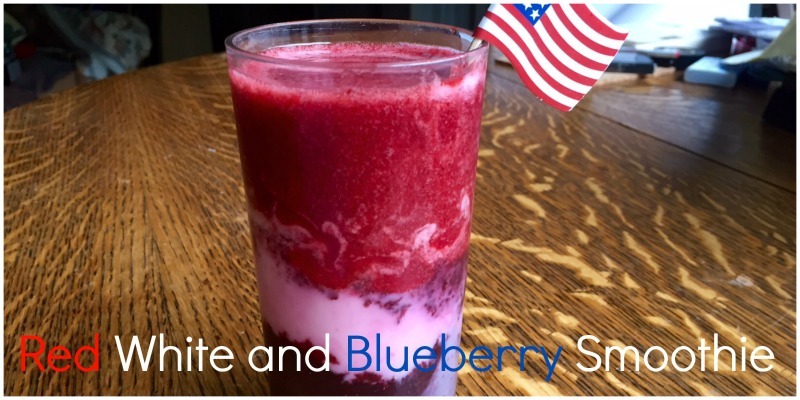 Once all three parts are made, pour into three to four glasses beginning with the blueberry, followed by the white and red smoothie layers. 3. Garnish with any patriotic item you like, or just grab some straws and drink up! Let me know what you think of this latest smoothie! And to those celebrating tomorrow, Happy 4th!